Chicago’s a tough town – mean streets, cold winters, great culture, the timeless Cubbies. When you think about trendy American tennis regions, Florida or California come to mind, not the Windy City. But with the Laver Cup coming to Chicago and Chicago-born Katrina Adams about to leave office as President of the USTA, here’s a little primer on the Second City. • Kamau Murray, the coach of former US Open champ Sloane Stephens, has a successful Chicago academy which was a key in Stephens’ career surge. • Mike Agassi and Richard Williams – the two fathers who plotted more than any others to have their kids become tennis champions – have curious, though brief, Chicago connections. Andre Agassi‘s dad Michael was a lost kid in Tehran, Iran—a failed Olympic boxer who lived in wretched conditions, one of 13 family members cramped close in an apartment and sharing a single bathroom. No wonder he dreamed of America, migrating to Chicago. He became an elevator operator and met his wife before heading out to far warmer climates in LA and eventually Vegas. Richard Williams’ path was uncannily similar. Facing unvarnished racism in Shreveport, Louisiana (think: humiliation, brutal beatings, grinding poverty, and no pathways to significant success) Williams saw Chicago as his out, a dream destination where African-Americans had real jobs, homes that didn’t leak, and weren’t brutalized. Williams hopped a freight train north and thought he’d arrived in heaven. African-Americans had cars, money, and could go to libraries. They didn’t beat you up for reading, like Williams said they did in Shreveport. He soon got a series of entry-level jobs and his own apartment. So just like Mike Agassi, Williams left Chicago for LA, where he came up with his audacious plan to raise two daughters who would win a lot of money and change the game. • Versatile Katrina Adams is one of the most significant USTA presidents. Chicago-born, she won the NCAA doubles championship, climbed to No. 67 in the world in singles, reached the fourth round at Wimbledon, and won 20 doubles crowns with Townsend’s coach, Garrison. For years, she headed the Harlem Junior Tennis League and was a Tennis Channel commentator. Adams is the first African-American USTA president. • Speaking of stars, Chicago entrepreneur Alan Schwartz not only founded a key Chicago club, he was the first person to emerge from the tennis industry to become president of the USTA. 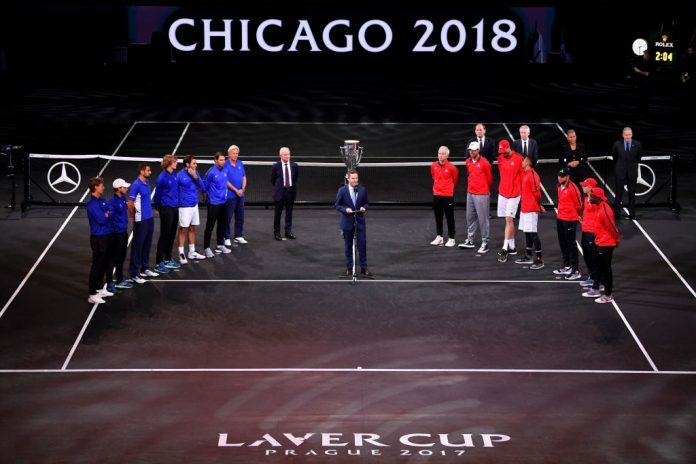 • In 1897, five courts were built in Lincoln Park…Wilson, a storied tennis company, is based in Chicago…Chicago’s Andrea Jaeger turned pro at 14, reached No. 2 in the world at age 16, and eventually became a nun…Marty Riessen was a high school and Northwestern University standout, before winning six singles titles on the tour. He gained a No. 11 ranking and teamed with Margaret Court to win many of his nine Grand Slam titles…Chris Evert‘s tennis teaching dad Jimmy was born and raised in Chicago…Long ago, the US Clay Court Championships in suburban River Forest were a mainstay of the summer clay court circuit…Hall of Famers Frankie Parker and George Lott lived in the city and Lott was the long time coach at DePaul…Hyde Park’s Michelle Obama loves tennis.